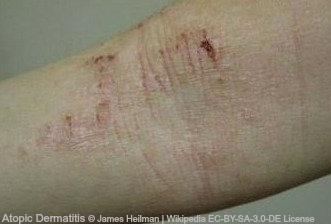 Atopic Dermatitis, also known as Atopic Eczema, it is the most common type of eczema. The word atopic is used to describe a tendency for allergies. A sufferer could also be more likely to suffer from any of the other atopic diseases. Asthma, hay fever and allergic conjunctivitis. Around 80% of sufferers get their first outbreak before they are 5 years old. Most of those before their first birthday. Around 15% of schoolchildren have the condition in varying degrees. Nearly 70% of those cases will have cleared completely or be much more manageable by the age of 16. It is still possible to have the condition in adulthood. Though it is rare to get your first outbreak after the age of 20. The symptoms of Atopic Dermatitis can vary depending on the severity. 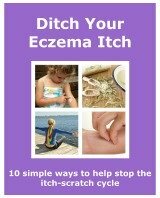 If you have a mild case you may have a couple of small patches of inflamed skin. They would most likely be on the fronts of your elbows and on the backs of your knees. At sometimes it will be itchy. If you have a severe case you will find that the rash will be on other parts of the body. It can appear on any part. It is likely to be extremely itchy. It could be very inflamed and signs of skin damage may be present, including broken skin and wetness. The symptoms will get worse if there is any contact with any irritants. It is also very important to recognise when the skin is infected. One of the complications of atopic eczema is a staph aureus infection. It is difficult to manage without antibiotics and needs to be treated properly. Atopic Dermatitis is known to be generic. So you are born with it. It is not known for definite what the genetic cause is. It has been found that if one parent has it, it is 60% likely the child will too. If both parents have it, it is 80% likely. Even though it is normally genetic, some allergens and irritants can make it worse. If they are concerns that it is down to an allergy, there are some allergy tests that can be done to work out what is causing the problem. There is no known cure. But there are ways to treat and manage the condition. It can be a little time consuming to find the best treatment. It is definitely worth it though. It is best to work with your doctor or skin specialist to get the inflammation, itchiness and infection, and any other symptoms, reduced. The diagnosis for Atopic Dermatitis is reasonably simple. If your child has any of the symptoms, especially if they are persistent, go and see your doctor. They will be able to tell you if it is or isn’t. As well as looking at the rash, they look at the condition of the skin. They may ask if you generally have dry skin. Especially in the last 12 months. The areas where any rash is, is important too. It is very often where the folds of the skin are. Inside of elbows, backs of the knees and around the neck. In children it is very common to find a rash on the face. It appears more often on the cheeks, eyelids and corners of the mouth. As a child I mainly had it on my face. When I had an outbreak around my mouth people said I looked like I had a 'blackcurrant smile'. I found that eating citrus fruits, and drinking fruit juice would aggravate it. If your child has it around their mouth keep an eye out for them licking it. This will make it worse. A doctor will also ask you questions about the medical history of you and your family. If your child is under 4, do any of your immediate family have or have had either one or more of the atopic diseases? As mentioned earlier, the atopic diseases are heredity. Are there certain things or situations that make the condition worse? If it is made worse by some allergens and irritants it will help to minimize an outbreak. I have had Atopic Dermatitis since I was a few months old. I had it on my elbows, knees, face and thighs mainly. The first treatment I remember using was a topical steroid cream. I still have Atopic Dermatitis on my elbows, knees and face, as well as Contact Dermatitis and sometimes Seborrhoeic Dermatitis. My mum has told me that she put mittens on my hands to stop me scratching. With the additional information being available now, it might not of been the best solution. They probably helped with stopping me scratching. But they were probably made of wool, so quite itchy and would make my hands hot. So not good for eczematous skin. It was pretty much a new thing for my parents. It tends to be generic but I have no immediate family who suffer from any of the atopic conditions. So we are not sure where its come from. It was a learning curve for them. Information was a bit sparse. Luckily nowadays there are a lot of places to get information very quickly. I also think that the condition is more widespread now. Whether its down to our lifestyles, the environment or just the general stresses of everyday living. Doctors seem to be more informed about it and can help tremendously with teaching us about treating and managing it. Some personal research does no harm at all. Any knowledge you get can help you to make the best decisions for you and your child.